Learn C the easy way. The updated version of Schema. A desktop hacker for all you cheats. Keep the peace and free Cyclops. Can't you do it? Now you can. Our special feature starts here. Professional CAD on the Arc. Acorns in the art world. Printing firms and their Acorns. The Hong Kong stock exchange. Running a small business on the Arc. Lucas Rists' use of Acorns. Corporate affairs at Acorn House. Make your own adventure game. 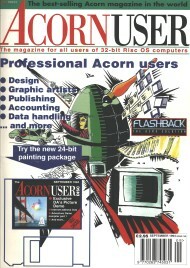 The site and all its contents copyright Acorn Publisher. Please contact the Editor for permission to use extracts from this site.